Solar eruptions come in many different varieties. Some are very dramatic and rapid with little warning, but others have a more gradual and relaxed character, and occur as part of a more general rearrangement of the corona. In this nugget we report on a series of interesting events that took place over a period of three days, starting 17 January 2013, that were associated with a slow eruption. The LASCO C2 coronagraph aboard the SOHO spacecraft observed a series of fast “puffs” exploding into interplanetary space, approximately once every three hours (Figure 1). These puffs coincided with the slower eruption of a more massive structure. 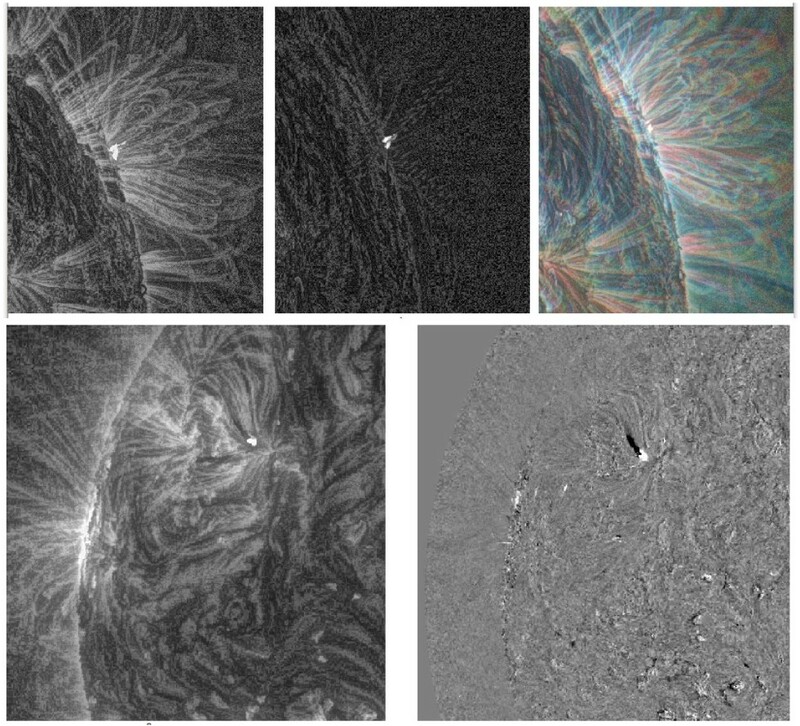 Analysis of SDO/AIA images show the impulsive events were caused by flare-associated jet-like eruptions taking place in an active region near the Sun’s limb. The jets seem to be caused by reconnection as a small region of opposite magnetic polarity emerges in the active region. This same reconnection process allows the more massive structure to slowly erupt, as the magnetic field that anchors the structure to the Sun is weakened. Thus we believe the active region jets are both the direct source of the fast puffs and, indirectly, the cause of the slow eruption. Figure 1: This LASCO C2 movie shows the series of events that took place during 18-19 January 2013. Figure 2: LASCO C2 dynamic (left column) and original (right column) time series images showing the course of propagation of one fast event on 18 January 2013 beginning at 09:45:00 UT. The fast events are faint and appear to have little structure except for a broad, faint front with an angular extent of ~30 degrees. They do not possess a classic 3-part eruption structure. As such, they can be described as puffs. During 2013/01/18, the rapid sequence of fast events means that the front of one fast eruption has not left the LASCO C2 FOV before another event enters the FOV. In Figure 2 the previous event is labelled ‘A’. The position of the slow eruption is labelled ‘S’ in the figure. The fast event overtakes this slow eruption and seems to interact with it. In particular, the slow eruption seems to be buffeted and encouraged to propagate outwards in intermittent steps by the fast eruptions. The fast eruptions travel at approximately 300km/s and are faint. They share their position in the images with the slow event and with the movement of more quiescent background coronal structures. It is very difficult to estimate the mass of the slow event due to sharing the same image region with the fast events. The fast events have masses of around 1011kg. The sources of these fast events are a series of jets which arise from a small flaring region. An example observed by SDO/AIA and STEREO/EUVI A is shown in Figure 3. These images have been processed with the new Multiscale Gaussian Normalization technique . The flaring region is seen on the disk by EUVI A at one footpoint of a system of large loops. The base of this region is just behind the west limb for SDO/AIA, although the flare brightening higher in the corona is observed. Jets are reconnection events between regions of opposite magnetic polarity and neighbouring open field . In HMI/SDO magnetogram a small intense region of field is seen emerging in a region of opposite polarity – a configuration ripe for the production of jets. Figure 3: Example of an impulsive event seen in SDO and EUVI images at different wavelengths for 18 January 2013. The top row shows SDO/AIA observations and the bottom row shows EUVI/STEREO observations. The fast puffs are plasma material driven by jets and travelling outward along open field lines. Height-time analysis shows clearly that the series of fast puffs are directly related to the series of jets. One interesting aspect is the broad angular size of the puffs, compared to the very small extent of the same events in EUV images. This suggests that the open magnetic field region arising above the jet expands very rapidly between heights of 1-2 solar radii. The slow, more massive ejection seems reluctant to erupt – it does not begin to smoothly propagate outwards until several jets have occurred. We believe that the reconnection which directly causes the jet events must also indirectly be causing the slow eruption by weakening the magnetic field which anchors the structure to the Sun. With each new puff, the slow eruption in LASCO images is buffeted, and becomes brighter – suggesting that each fast eruption may add more mass to the slow event. Impulsive fast and faint puffs observed in coronagraphs are associated with jets, and many of these puffs can occur in rapid series from a single region – over two-three days in this case. The jets are also associated with small flares giving signal in radio observations indicating reconnection and rapid heating. HMI magnetogram and PFSS extrapolation shows a magnetic configuration compatible with models of jets. The reconnection driving the jet activity also allows the irregular eruption of a slow event which is more similar to a small CME. We believe that the series of reconnection events is weakening the field which anchors the structure to the low corona and allowing its slow, irregular eruption. Thus jetting activity in a small active region is driving both fast, impulsive puffs and a slow, more massive eruption.